Medication compliance has been a problematic issue across the United States for quite some time, but there is a myriad of factors that come into play regarding this medical quagmire. Just to begin, much of the critical faults lie with miscommunication and misinterpretation—in other words, patients aren’t understanding the significance of taking their medications; specifically, those within elderly communities. This health care crisis is worsened by a lack of access to medication education, the quality of the patient/doctor relationship, and as always, affordability of the medication itself. If a patient isn’t fully aware of what a medication provides to them, and it is expensive on top of that, then a great many just won’t get the prescription filled at all. Research has also shown that poor adherence patterns persist when physicians, pharmacists and caregivers fail to address the main concerns patients have. For instance, their belief systems and own safety concerns about a prescription drug should be taken into consideration. Without strong communication and medication counseling, most patients have no commitment to continue their medication therapy, or even begin it—especially if they feel it isn’t benefiting them at all. Currently, over 187 million Americans are prescribed prescription medications at any one given time for chronic or acute diseases and illness. Some major mistakes come into play when a patient begins to feel better and stops taking the medication. Another problem is when patients just can’t afford to get the prescription filled in the first place—which leads to a hospital stay or other significant adverse consequences. Of course, it all takes a heavy toll on the health care system, and as was mentioned previously, many patients end up becoming hospitalized or suffering unnecessarily. There are many patients who die prematurely or suffer from a disability due to non-adherence to their medication treatment. Unfortunately, a ménage of studies and academic reports illustrate that over 50% of medications aren’t taken as they are prescribed. Because of this the direct and indirect costs are excessive and clearly burdening the system. What most don’t know is the huge expense this is placing on the health care system in general. It is estimated that these compliance issues are pushing costs over $290 billion a year. This is in addition to normal health care costs that facilities must account for. Each year it is projected that 126,000 deaths will occur due to medication non-adherence and 25% of nursing home admissions will take place. This is all avoidable if the right procedures and steps are put into place. For example, if medication instructions were given properly each and every time, some occurrences could be avoided, if not all. However, physicians claim to have a lack of blocked out time with each patient, and many fail to give proper information on a prescribed drug. In fact, almost 19% to 40% of written prescriptions are done so without ever fully explaining how the medication works to the patient and what they can expect. Physicians simply don’t take enough time to discuss medication concerns and dosing directions 60% of the time. This leads to an estimated 33% of adverse outcomes. There is a very real opportunity for physicians to change their communication styles and improve the doctor/patient relationship to potentially minimize the risks for medication compliance issues. A patient-centered and engagement approach is believed to be the more effective one, because it focuses on communication and helping patients feel more comfortable with their providers. When there is a physician-patient connection, research shows that medication adherence does improve and patient frustration and anxiety is lessened. Medication non-compliance affects more than just doctors and private practices. The three major areas that are adversely impacted are: patients, pharmaceutical manufacturer’s and again, the health care system as an entirety. For patients, non-adherence to their medication often shortens their life span and depletes their quality of life. They also suffer from reoccurring illnesses that become chronic when they refuse to adhere to a treatment regimen. Remember, it might not be intentional but the consequences are still the same. For pharmaceutical companies this places a heavy financial burden and the loss can be in the billions. Pharmacies lose about $8 billion annually due to prescriptions never being filled—but there’s more than this to worry about! Costs can be excessively more if they are needed for chronic conditions and the proper plan isn’t being followed. As was mentioned previously, the rising healthcare costs due to non-adherence issues impact everyone, not just those patients who aren’t following the requirements. Increased hospitalization rates mean less room for patients needing admission for normal circumstances like day surgery, illness and other medical complications. While progress to correct the problem is being made there’s still a lot to do. Today, 50% of patients adhere to their medication treatment while the other 50% does not. Now, patients with chronic conditions can suffer the most if they don’t follow their medication plan as they should. For instance, skipping a day here and there doesn’t help a patient’s well-being, even if the patient has no idea. Many people do this to try and cut back on costs and save money, but in the long-term it causes more harm than any good. This is where improving pharmaceutical costs could make a dramatic difference with compliance. Sadly, the costs are the very reason why 1/3 of prescriptions are never filled and those that are filled often are not administered in the most effective means possible. Experts are looking at nonadherence today as America’s newest emerging drug problem—not a good thing. If it hasn’t already been mentioned, this crisis contributes $100 billion to the health care system on an annual basis, while indirectly, costs currently exceed $1.5 billion in lost wages for patients. Another $50 billion comes from a loss of productivity on the job, so statistically speaking, this is at an enormous level and still growing in some parts of the country. It would seem the more rural parts of states struggle with medication compliance issues more so than those that have better medical access. Contribute to about 20% to 30% of many employer’s healthcare costs. If nonadherence could be better controlled, then these percentages could decrease and revenue could grow rather than be lost. As has been being discussed in this literature, there are many reasons why patients are nonadherent with their medication regimen. A primary one is due to a decline in cognitive function within the elderly. Within the younger generation, compliance issues can be due to a mental health condition as well. While many experts and medical professionals had initially believed, the problem was more situated around forgetfulness, it appears to go far deeper than that. In fact, research is showing that only about 24% of non-adherence issues arises from forgetfulness. Another 20% of patients failed to continue taking their prescribed medications due to worrying about side effects, and an additional 17% refused to remain compliant simply because of the drugs costs. Some people just don’t feel that some prescribed medications are absolutely necessary and in fact more and more people are beginning to feel many general physicians are simply pill pushers, promoting new drugs from pharmaceutical companies. This is happening because of a lack of communication in the patient/doctor relationship, and it’s never a good thing. The patients being described right now are normally not those who would take their prescriptions even under a conventional, medication awareness program. This is basically because their own concerns and fears aren’t addressed by their providers—something that was mentioned early on in this literature. Medication non-adherence has a trickledown effect, and it does start with the medical community itself. 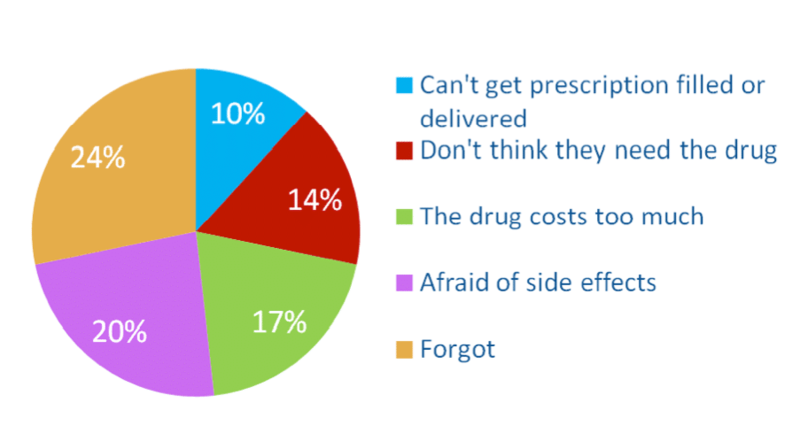 Once reasons for non-adherence can be addressed improvements can be made. Experts say that a custom approach is what is necessary to make an impact and this is what encourages those on medication to continue their treatment. An of this can be given with something like forgetfulness. Many patients do well if they are signed up with a medication call reminder service. The phone ringing and the message on the other end keeps them informed and reminds them of the importance of their medication and what time they should take it. It is an extremely effective resource for the elderly. However, those who aren’t compliant because of prescription drug costs would follow their regimen if they were offered program rebates or discount loyalty cards. There is a shoe-size for every group of people who aren’t following their therapy for concrete reasons. Another good example is an individual worried about the side-effects of a prescribed drug. A medical education awareness program might be the perfect solution for those in this group. Do Digital Medication Adherence Programs Work? While there is no single strategy that effectively works to decrease compliance issues, digital services that collaborate and utilize several effective methods to decrease these adversities are reliable. There are so many factors that must be taken into consideration with regard to non-adherence—it takes more than just one strategy, it takes a long-term effort. This has been being discussed through this literature, and it is so very true. Now, an online medication reminder service that provides networking, connection with caregivers and providers, and which works well for the patient themselves is perfect. It might also prove to be even more effective when paired with community support services. What is being learned about some of these services to combat non-adherence is that they are, normally inexpensive and seem to produce better results than just dependence on a provider does. From direct mail reminders, to pill reminder programs offering pillboxes, on to self-help counseling services and other related materials; there is a lot online and offline that might prove to be very useful. Outgoing call pill reminder services not only benefit the patient but they put the caregivers mind at ease as well. Those more advanced, such as with our medication reminder service alerts the primary caregiver and direct relatives when the family member has taken their medication as they should. User friendly and simplistic in design is what is needed the most for the majority of people. These features and others which will include people from all age groups is important. Because many people need these medications they are prescribed to maintain their well-being, there simply must be some reliable interventive services established. The fault of compliance issues doesn’t rest solely in the patient’s lap, as we’ve mentioned. A great burden falls on the medical community itself which has failed to provide adequate education and supportive services to ensure people do follow through on their medication treatment plan. Digital technology is paving the way for a lot of new and exciting things in the current century, but one of the more purposeful areas lies in the conundrum of compliance for medication treatment. The sad fact is that some of the failings and adverse circumstances are due to physicians who claim to be too busy to implement digital services that might lower medication non-adherence and actually save lives. As we have said before, a new approach to minimize adherence issues still needs support from all parties to be most effective. It takes the caregivers, the primary care physician and the patient themselves to be willing to work together to ensure everything is on track. But medication call reminder services do work. Patients need to understand their medical condition fully and understand that long-term adherence to their medication can improve their lives. Some pill reminder services offer access to community information that can be of assistance for specific groups of people too—namely the elderly, as compliance issues reign heavy in this age group. All in all, digital services are helping transform lives and regulate medication therapy programs. While there might always be some amount of non-compliance, services such as these and others are really what is needed to start improving upon patient care in and out of a medical environment. If you’re attempting to facilitate a service to help with medication adherence, our program is one of the best and does its job well. We offer a trial period to make sure your medication call reminder service is a fit for your loved one. Whether this is for your mom, dad, aunt, uncle or perhaps a brother or sister—it helps to alleviate the worry and stress that comes with adherence issues. Keeping your loved one track is the goal and we think that this program can help do just that.